•Given all the “liberal-tarian” moaning over at the BleedingHeartLibertarians site about how the rest of us benighted libertarians need to think more about “white privilege” and the like, presumably they think programs like one suggesting white students be made to wear wristbands that mark them (by race) as beneficiaries of “privilege” are something we should encourage. One would like to think that even kids can see through political indoctrination to some extent. As I tweeted recently, my own schooldays exposure to East Germany came about one year before that country ceased to exist, as two visiting East German students assured an audience of dutifully attentive, left-leaning Brown students that the U.S. was inferior to their own country due to our lack of socialized medicine and omnipresent security surveillance. Now their country’s gone and ours looks just a bit more like theirs did, but I’m not sure who the winners and losers are in that shuffle. On the bright side, east-Germans (now in the regional rather than national sense) provide a semi-outsider perspective within the larger German nation – a bit like Hispanic comedians in the U.S. – so that we get installation and performance artists like Sindy Butz doing shows in Europe and the U.S., promoting wearable ceramic devices of use to people of all political persuasions, and meeting me on the subway from Williamsburg a couple years ago. •Speaking of failed utopias, it’s probably just as well for my political purposes that plans for a BioShock movie are dead. It’s nice the game creators cared enough about libertarianism to satirize it, but the world is probably slightly better off without a movie that would have suggested, in effect, that Ayn Rand and seasteading lead to dystopian monster-fighting. •In 1948, though, East Germany was still very much a going concern, and Joel Agee, eight year-old biological son of Pulitzer-winning American author James Agee, went with his mother to live with his stepfather, prize-winning East German author Bodo Uhse. I was impatient, and willing to settle for any profane substitution. I bunched blankets and pillows and sheets into a rudimentary but at least tangible effigy of a recumbent woman, indented and puffed her out in the appropriate places, insinuated myself in the sheath I had prepared between her spread thighs, and abandoned myself to passion. In no time at all, her form, tenuous to begin with, had reverted to chaos. One gets the impression it didn’t really take that much effort to distract the populace (of all ages) from the socialist catechisms they were supposed to be imbibing. Easter was still celebrated, rock n’ roll music from the West was listened to with enthusiasm (when a delighted Joel heard Chuck Berry on the radio for the first time, “That’s when the evil virus infected my soul, and what an exhilarating disease it was”), and earnest Communist Bodo Uhse was easily discombobulated by Joel’s innocent, youthful questions such as whether the East German government’s special reluctance to let high-paid professionals such as doctors migrate to the West logically implied that some people are more valuable than others. Still, Joel was sincerely Communist as a child, and you can’t really blame him when even a skeptical viewing of the evening news yielded sights such as the anti-Communist rebels in Hungary in 1956 delighting in abusing the bodies of Communist fighters they’d slain (“Thank God for the Soviet tanks,” thought young Joel). It’s worth keeping in mind that a little savagery goes a long way in the other side’s propaganda efforts (Abu Ghraib, etc., etc.). A neighbor who had written one of the most famous of the many heroic odes to Stalin declared in a fit of self-loathing that what he wished to be more than anything was a lumberjack in some remote country like Norway. Very shortly after that, he was introduced to a Norwegian lumberjack who wanted nothing more than to leave his backwoods existence and be a poet engaged in the battles of the day. Simply being a laggard and hooky-player was enough to get Joel condemned by a student/teacher council at one point for infecting “the student body with the virus of bourgeois individualism and the kind of provocative behavior we have witnessed today.” Meanwhile, sneaky adult friends of his parents played Monopoly on the sly after a set was sent by his maternal grandfather back in the U.S., and they wondered about life in the West, growing increasingly cynical. But Joel focused on the non-political, had a brief but cute formative romance with a traveling Indian girl, and in time decided to become a writer. 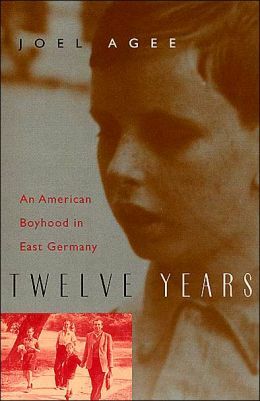 His stepfather’s affair with an East German woman became the occasion for Joel and his mother to move back to the U.S. – after she opened up to him like never before with bittersweet reminiscences about her youth and the house full of tamed mice she shared with James Agee in New Jersey. And though there is (as I write this) no Joel Agee Wikipedia page yet, my curiosity about his current activities led to his personal website, where this familiar two-minute videoclip explains what he’s up to today and leaves no doubt which nation’s popular culture won in the end.